Warning: You are about to see images of the most mouthwatering mozzarella stick grilled cheese and a to-die-for bacon mac and cheese empanada. If you’re viewing this on an empty stomach, you might be tempted to lick your screen. There are some delicious things going on this week in the food world. Catch up on all the tastiest stories you missed, and try to resist the screen-licking. Though I wouldn’t blame you for doing it. And don’t forget to check out last week’s most eatable food news. You haven’t lived until you’ve seen a rice bear under an omelet blanket. You now have a legitimate excuse to eat candy for breakfast, and you have Jelly Belly to thank. The new Pancakes & Maple Syrup flavor just begs to be eaten in the morning. 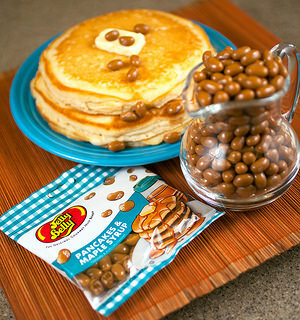 And because Jelly Belly knows how to party, it suggests a “brunch” flavor combo by eating 1 Pancakes & Maple Syrup jelly bean + 1 Champagne jelly bean + 3 Orange jelly beans. Really, you could eat candy for every meal using that rationale. Which ones do I combine for steak and red wine? If you’re like me, Fire sauce just doesn’t get it done anymore. It’s like you’re sprinkling your chalupa with ketchup, amiright? 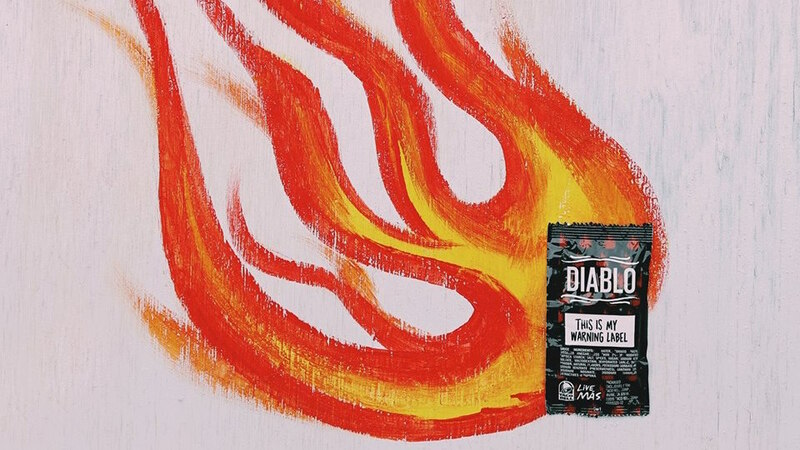 Well, good news… Taco Bell’s new Diablo sauce promises to bring the heat come May 5. I’ll believe it when I reach for the glass of milk. 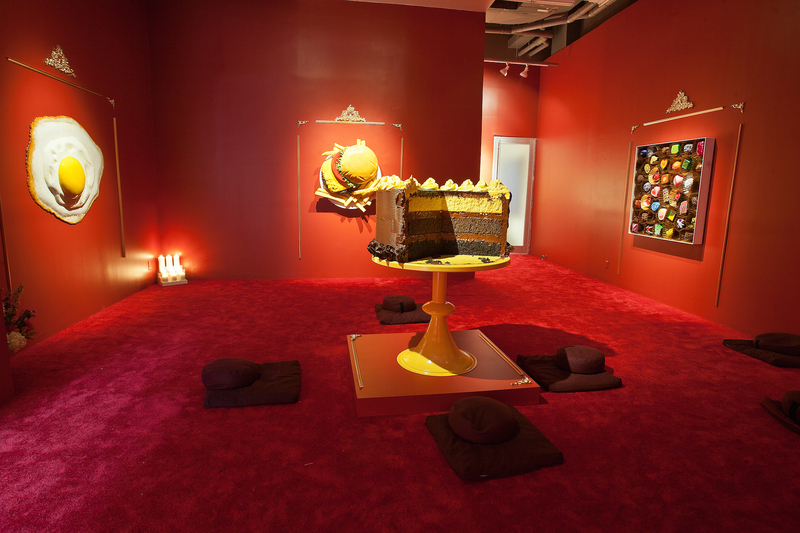 The Foodhist Temple is a must-see installation currently on view at UNIX Gallery in New York until May 14, 2015. “The temple will be a place of meditation, peace, and happiness — a shrine devoted to the celebration of food and life,” says artist Peter Anton. “With heightened color and exaggerated forms, my work promises the unattainable in life: ultimate satisfaction,” says Anton. “Food evokes a sense of well-being and is an important part of the special memories in our lives…I activate the hunger people have for the things that give them pleasure.” As someone who finds total peace by being surrounded by food, this makes total sense to me. And really, what better place to reflect than in front of a giant chocolate cake? With Easter in the rearview mirror, Cadbury had a little free time on its hands. And when Cadbury gets creative, great things happen. 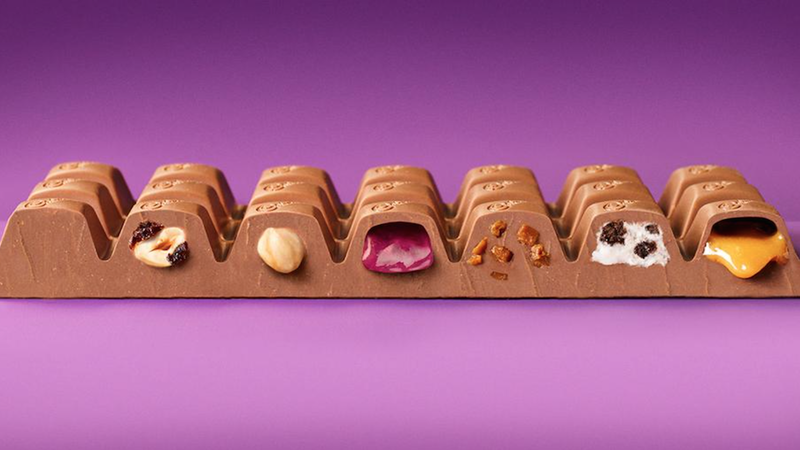 It has made a candy bar with seven different but equally delicious fillings: Turkish Delight, Oreo, Daim, Caramel, Whole Nut, Fruit and Nut and classic Dairy Milk. It’s aptly called the Spectacular 7, but since Cadbury can’t let us get too comfy with its candy, it’s producing only 50 bars worldwide. Worldwide. I envision some pretty hefty eBay price tags in the near future. Keep your eye on Cadbury’s Twitter for a chance to win one. Because we shouldn’t have to decide between bacon mac and cheese and empanadas. If I can’t eat dulce de leche straight from the jar, I can’t think of a better way than these luscious snickerdoodle bars from Julie’s Eats & Treats. Just look at all the dulce de leche goodness oozing out. Drool-worthy and then some.